The denim quilt I was planning got pushed back while I worked on wedding projects. Now that the wedding is over I'm actually working on the quilt! I purchased a pattern to follow since I don't know what I'm doing and figured following instructions would be easier than making it up as I went along. The pattern is Opposites Attract by Meredith Daniel & Alison Glass and is a three color quilt with the option of a fourth color. I've decided to use dark denim, light denim, and light denim dyed purple for my main colors with some of the floral denim as the fourth optional color. I hoped there was enough denim for a queen sized quilt, but I'm not sure there is. 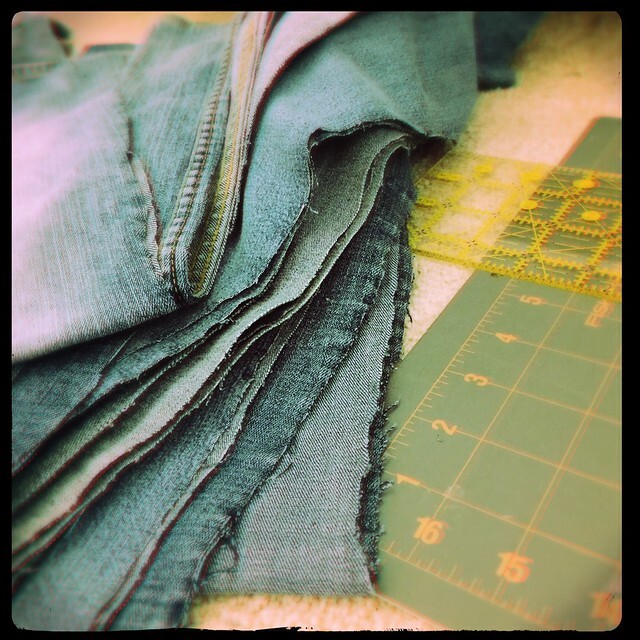 Currently I'm preparing larger pieces of denim to dye and figuring out how large of a quilt I can make. The 8.5" squares seem to be the limiting factor right now, I may be doing some piecing together for some of the larger squares. We will see how it goes. I hope to have everything dyed and most of the pieces cut out this weekend.